Text messaging or Short Message Service (SMS) as a form of communication offers unique advantages to traditional phone call communications. The typical U.S. mobile subscriber sends and receives more SMS text messages than telephone calls. In an attempt to understand text messaging behavioral intention and encourage its adoption, this manuscript explores the text messaging behavior using the variables from the models of human behavior known as Theory of Reasoned Action (TRA), the Technology Acceptance Model (TAM), and the Diffusion of Innovation (DI). Variables from each did contribute to text messaging usage. In addition, an analysis of text messaging by age and student status was performed. Overall, there was no difference found in intent to use text messaging by age or gender. Also, no significant difference was found in frequency of text messaging and time spent texting by gender. Age, did show significant differences supporting statistics that show younger individuals text more. 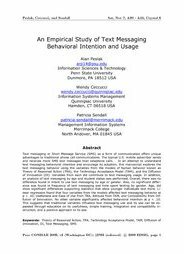 Linear regression found that four variables from the models affected text messaging behavior at p < .10, Usefulness and Ease of Use from TRA, Attitude from TAM, and Compatibility from Diffusion of Innovation. No other variable significantly affected behavioral intention at p < .10. This suggests that traditional variables influence text messaging use and its use can be expanded through education on its usefulness, simple training, integration and compatibility instruction, and a positive approach to its use.